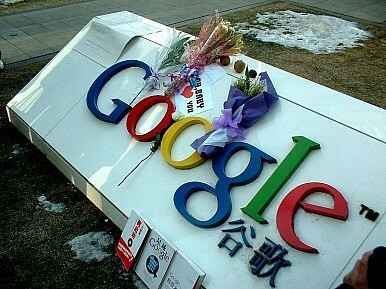 A flower tribute on the logo of Google's offices in Beijing in 2010, just as the company shut down China operations. Google’s potential re-entry into the Chinese internet search engine business is garnering a great deal of attention, not much of it laudatory. Google drew praise for its ethical stand after exiling itself from that market in 2010, based on a hacking scandal and the company’s refusal to self-censor, as required by the Chinese government then and now. Now it faces criticism from media and the U.S. government alike over reports that Google is considering launching a censored search engine for use in China. Hilton ended the segment with a warning. “Don’t be evil!” Hilton told Pichai, using Google’s famous edict for its employees’ code of conduct as a stark reminder to the CEO of the utopian vision Google once claimed for itself. Such a search engine would also be expected to aid authorities in identifying users who search for content or post comments “unsafe” for society, leading to potential arrest and detention. In other words, Google is now planning to contort itself to comply with the very censorship requirements that led the company to take the principled position of leaving China eight years ago in the first place. It is a coup for the Chinese government and Communist Party to force Google – the biggest search engine in the world – to comply with their onerous censorship requirements, and sets a worrying precedent for other companies seeking to do business in China without compromising their core values. The letter then sets out a list of detailed questions for Pichai relating to how the company would comply with China’s notoriously strict censorship requirements. “Which ‘blacklist’ of censored searches and websites are you using?” they ask. “Will Google employees… be required to attend the official mandatory trainings on ‘Marxist news values’ and ‘socialist values’ as required of other technology companies” in the internet business in China? While it is encouraging to see bipartisan efforts to confront what could be a major breach of both ethics and security by a quintessential American company, it must be noted that there is a hint of the disingenous in targeting Google for setting “a precedent” for other companies planning on being in China. Many of those companies already long predate Google’s potential arrival on the scene, and have battled for decades with the conflicts of business and ethics that working in China present. The question of how to maintain both corporate as well as personal integrity while working in an environment which severely controls freedom of expression, religion, and assembly is problematic to most international players in China. Companies making toasters and toys have less complicity with the Chinese government’s efforts to control the information that its citizens receive and transmit than Google does, but many of those companies nonetheless have valuable insight into how to operate responsibly in China without adding to the government’s capability to limit its people’s rights. Perhaps Google could profit by their practice, and their example. In a supreme irony, the most powerful Communist Party mouthpiece in the world, China’s People’s Daily, published a commentary this week welcoming back Google, one of the most successful capitalist companies in the world, while at the same time chiding it for leaving in the first place. As quoted in the South China Morning Post on August 8, the commentary says that leaving China was “a huge blunder which resulted in the company missing golden chances.” People’s Daily goes on to say, tongue in cheek, that Google is “a politicized brand…[which is] undoubtedly a tragedy” for the company. The Communist Party has long understood that, ultimately, profit is the overriding principle which drives the capitalist; it remains to be seen how far that principle will take Google in China. Google Maps and Google Translate have returned to China after the company withdrew from the Chinese market in 2010.